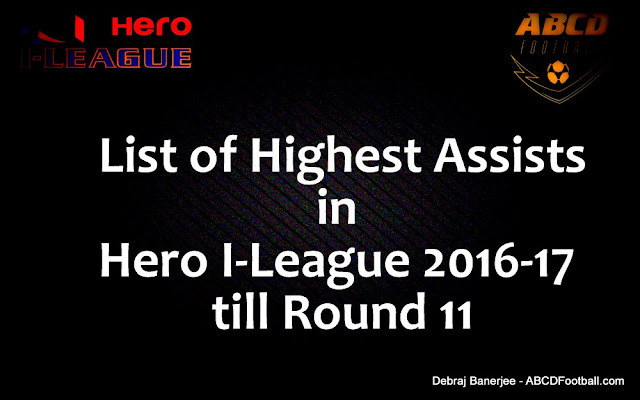 Here the list of players who have assisted most number of goals so far(till Round 11) in the Hero I-League 2016-17. East Bengal's Lalrindika Ralte tops the chart having assisted 5 goals while the struggling defending champion's midfielder Cameron Watson has notched up 4 assists, the same number as Isaac Vanmalswama of Shillong Lajong FC. * We have only included the list who have assisted more than 1 goal. Note: The list of assists are carefully obtained from match videos and reports. In case we may have missed any assists, we would apologize for those. If you feel that there is any change in the above stats provided do contact us.